work | this is what I never expected to do. I can’t remember everything I want to share with you! I don’t know where to begin. There are so many little things I want to tell you about, and a couple of really big things too. The past couple weeks have flown by. They’ve borrowed this word from English in Japanese, just like they’ve borrowed a lot of other words (video, coffee, toilet, digital camera, supermarket, etc.). A lot of the borrowed words retain their meaning. Naive, however, in Japanese, refers to sensitivity – particularly of the skin. I had found it unusual the way that soaps and moisturizers are named here, with words like “Naive” and the like. But then it came up in a lesson last week and a student explained it to me. Who knew! One of the lessons I taught yesterday to my group classes was about true love. Two of the four students didn’t show up because of work, so it was just me and two woman. As much as I try to pretend to not be any kind of romantic, I really enjoy talking about it, so it was fun. There’s nothing much more to say about this, actually. There were no apparent major cultural differences of opinion on the subject. I think that’s what I found most interesting. On the other side of the world, notions of true love are very similar. I guess when you consider the popularity of western movies in Japan, this might not be surprising, though. I will go into more detail about my visit to my family later, but when I was visiting my distant cousins this past weekend for the first time, it happened that they brought me and my family visiting from Canada some coffee and these lovely slices of cake. And then they left the room for a good while because that’s what you do here. The cousin closest to my age, who is quite fluent in English, tried to stay to chat with us, but her mother called her out of the room. The idea is that if you have gone to visit someone’s house, you might want some downtime alone or something. So they bring you some light refreshments and leave you alone. We told our cousin that whenever she comes to visit us in Canada, we are going to be quite rude and stay with her the whole time. Obviously. I think we all know this by now. But I enjoy those moments in my lessons when my students tell me that I’m acting Japanese. I was getting sort of flustered trying to explain the difference between special and specific to a student yesterday, and going into a lot of detail and he stopped me saying to not worry, and that I was being very Japanese. It’s happened a few times before as well. I like it! I’m trying hard to not worry or stress over my job. I think there are a lot of things I could complain about if I wanted to, but I actually am learning to like being there. Now that it’s a couple months into my contract, I’ve started to have regular students coming in for my lessons, giving me an opportunity to get to know them better. When I have different students all the time, and no consistency there, it’s hard to feel like I have any impact at all. But when I’m meeting the same students every week, I can see where they’re improving and see their confidence in speaking a second language increasing. I’m not particularly happy when I’m not doing anything for other people, and my job is a great opportunity to do that. Sometimes I even look forward to it. This is good. I tried nato at my family’s. It’s basically fermented soy beans. Most people I’d talked to prior to trying it said it smells awful and doesn’t taste that good either. But my cousin urged me to try it and so I did. It wasn’t that good, but it wasn’t that bad. Maybe google this one, just to read what people say about it, and maybe see a picture, because it kind of looks gross too. A woman fell asleep on me last week on my way to work on the train. I could see her nodding off, and then her head was on my shoulder. No one else was looking or noticed, so I sat there, trying to act like it was nothing when I really just wanted to laugh. I’d heard that that happens, and it now it finally has! What a comfort it is knowing that I have family here, only a short train ride away (well, short relative to a long flight over the ocean, anyway). Meeting family for the first time, especially family in a different culture and country and language, I had no idea what to expect. Given that my aunt and cousins from Canada who I was going with had met them before, I wasn’t too concerned about them being welcoming, but their welcome was warmer and greater than I had anticipated! A few of them met us at the train station and were so kind. We were driven back to one of their houses where we spent the day. I learned that my one cousin and his daughter (the one close to may age) perform with a Taiko drum group (if you google “Tennon Daiko Wakayama”, you’ll find at least numerous references to them). They took us to where they practice and we all got to play on the Taiko drums, which was really, really cool. Of the family there, only two out of seven of them speak English, only one of them fluently. I need to learn more Japanese to talk with them! I am hoping to go to visit again in the next few months. It’s hard to articulate the experience of meeting distant family for the first time. There is so much, I think, that can only be felt and not spoken. It’s not that family didn’t mean much before I came to Japan, but it’s become that much more important now that I’m on my own in Japan. One of my aunts and her two daughters were in Japan for the past two weeks and I was able to spend some time with them. It was so nice. The idea of a year (and then some!) without seeing my family – aunts, uncles, cousins, nephews, parents, and brother – was daunting. it’s April and I’ve been here two months now! Some days, there are a million things I want to remember to mention on here because I think they are interesting. But then when I actually sit down to write anything, my mind draws a blank. What I find happening sometimes is that I’ll think something’s really cool or interesting, but after even a short amount of time passes, it doesn’t seem as cool or interesting and so why write about it? I’m keeping busy. Which is good, because I find I get mopey when I’m not busy. My days off are spent running around doing things, even when I sort of just want to chill out in my apartment for a few hours and relax. I am still in that frame of mind where I feel like I need to go see something on every day off. Maybe I’ll get over this. I don’t think it’s my being new here that’s motivating me to always be going to see things so much as the idea that I’ll only be here a year and well, there’s a lot to see. This past week, I made trips to the Umeda Sky Building and Nara Park. I also tried a nice Thai restaurant (not as good as the one I worked at back home, but it’ll have to do) and a falafel restaurant. The Sky Building was neat for getting a good view of the city. It’s amazing the way it just stretches on and on. I don’t really feel like I saw “city” back in Canada when I see some of the cityscapes here. On one hand they’re breathtaking, but at the same time, they also emphasize the lack of green space. Osaka’s especially concrete and grey. I haven’t been yet, but I hear that Tokyo has a lot of green in it. Beautiful areas and parks and places full of trees are just a short distance away though. Thankfully. Nara Park was beautiful. I’ll be going back. We didn’t get there until late in the afternoon.. My day was slow to start. It was mild out, trees are starting to blossom, and it was in the middle of the week and not busy whatsoever. We took our time wandering around, not sure where we were going, but going down whichever way the paths took us. This weekend and next weekend are viewing times for cherry blossoms (Hanami). I’m going to a couple of get togethers tomorrow, and still figuring out what to do next weekend. I’m excited. This is one of those things I remember learning about when I was 10, and have always always always wanted to see the cherry blossoms in Japan (well, since I learned about them, anyway). I’ve started my contract for the next year. Started April 1, goes through til March 31, 2012. I have a full schedule. I have two adult classes (80 minutes long each), four or five kids classes (typically an hour each), and a bunch of those free time lessons (if you don’t know what these are, go back a couple posts!). I’m looking forward to it. There’s a lot of commuting involved, some days around an hour or more each way. I’m hoping that if I can get enough sleep the night before, I’ll be able to do some reading on the train, but trains and reading both make me sleepy. The combination will likely be brutal. Speaking of books, I got a library card. The library is maybe a five or ten minute walk up the road and they have a small English section. Some of the bigger libraries of course have a larger English section, and I can have any of those books delivered to my neighborhood library. I doubt I’ll go very often, seeing as I brought quite a few with me (well, quite a few for me is probably not very many for other people.. I’m a slow reader…). brief run down of the first day, and I don’t think the big city’s for me. My first day on the job went well overall. It was a full schedule of substitute teaching and I know I messed a few things up, but I knew that would happen and it’s okay. Teaching children is going to take some getting used to. I’m totally alright with teaching teenagers. That’s fun. But anyone younger than 12? It’s not that I don’t like it; I’m just not used to it. Making some small talk, the school director asked me my husband’s name. I clarified that my last name is my father’s last name. She had been expecting someone more Japanese than me. It’s been interesting having a Japanese name in Japan, but not being Japanese. In Canada, that sort of thing’s pretty normal. A friend here who speaks decent Japanese likes to introduce me to Japanese people, telling them my first and last name, mostly just to see there reaction to it being Japanese. This usually results in them talking to me in Japanese, and me getting a little flustered, saying awkwardly, “Wakarimasen..!” (I don’t understand..!) or “Nihongo ga hanasemasen!” (I don’t speak Japanese!). Then said Japanese person talks to my friend, and I recognize the words for “Canadian”, “father”, “English”, “doesn’t speak or understand”, etc. I tried a Big Mac for the first time. It was alright! 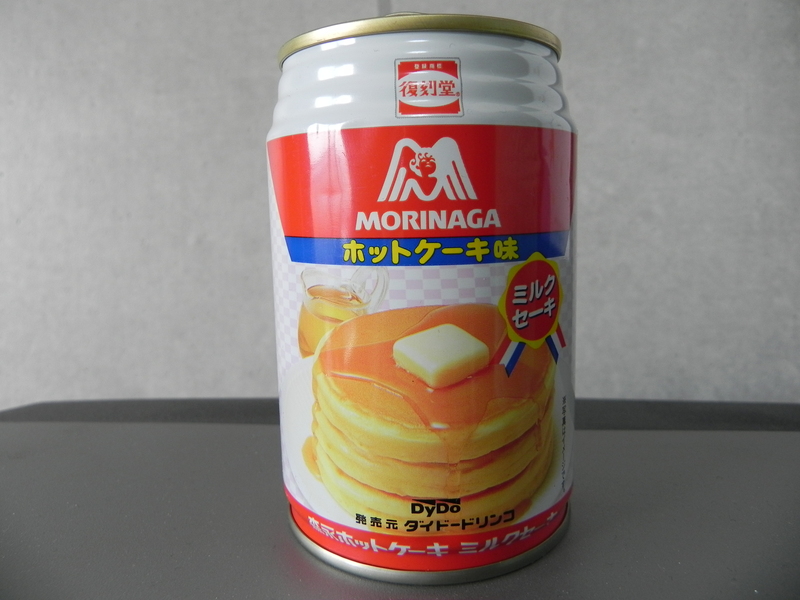 Also tried a hot pancake-flavoured beverage. I originally wanted something cold from the vending machine, but then when I saw that, I couldn’t help but get it instead. The variety offered in vending machines here is still novel for me. 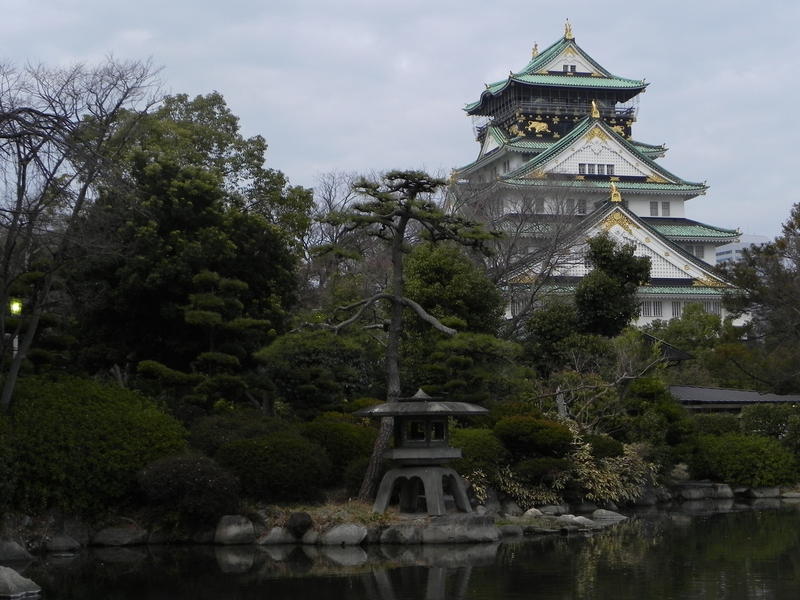 An afternoon trip to Osaka Castle this afternoon. I ventured alone, and ended up being out way longer than I expected. I thought I would just take a short wander to check it out, make sure I knew where it was, and then go back another day for more exploration. Decided to do a lot of exploring today instead. It’s the most beautiful and green area I’ve found yet in Osaka. There were so many blossoming trees. They looked sort of like cherry blossoms, but I heard that before the actual cherry blossoms, there are other blossoms (someone called them “brown blossoms”, though they’re not brown… pre-blossom blossoms?). Anyway, they were pretty. Dark pink, light pink, white, and everything in between. And they smelled amazing. Osaka Castle is super cool. It’s not the original, as the original was burned down a long time back, and then rebuilt, and then burned down again, and then rebuilt. Still a beautiful structure, though. Surrounded by impressive walls and a moat. Surrounded by gardens and parks. Come visit and I will take you there! Wandering around I thought a lot of the Niagara Parkway and the botanical gardens and the floral clock and the vineyards and summer days along the Niagara River in the sun. I imagined how it must feel seeing all of that for the first time as I wandered around Osaka Castle for the first time. It’s wonderful living so close to those beautiful things, in the Niagara Region, and now here in Osaka. I’ve always wanted to live in a big city for awhile, just to see what it’s like. When I was out wandering the grounds of Osaka Castle today, though, and when I think of Niagara, I can’t imagine spending a long time in a big city. My first instinct is to say that it’s too much, but when it comes down to it, it’s not enough. CORRECTION: The trees I found were plum trees. 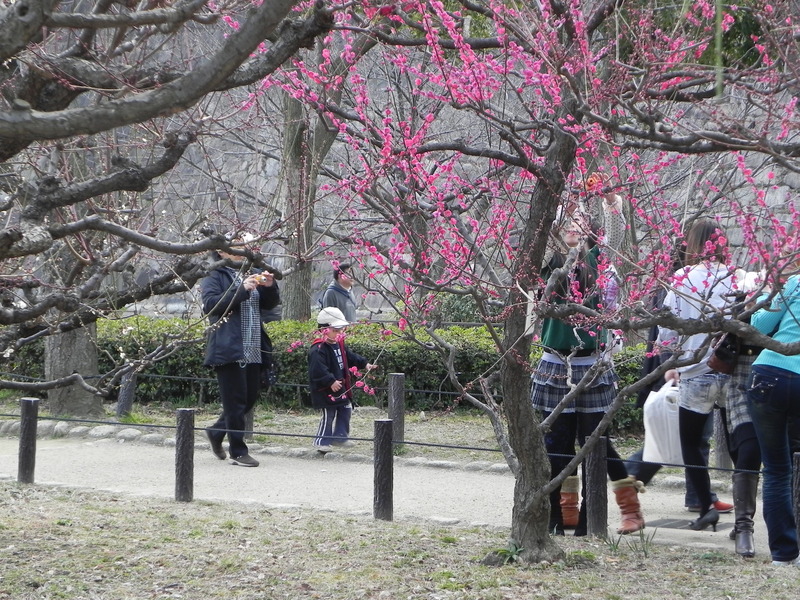 It is a plum grove. Anyway, still super pretty and fragrant! You are currently browsing entries tagged with work at this is what I never expected to do. .